100% Money Back, Sold Out. Available now, the New Edition of "Secrets to a Successful Greenhouse and Business"
A Complete Guide to Starting and Operating a Organic or Hydroponic Business That Benefits the Environment. Get it from the Publisher here. This 11 Section, Greenhouse Guide was written by T.M.Taylor, one of the nation's quality growers, to encourage and promote the profitable home greenhouse business of growing Annuals, House Plants, Potted Plants, Flowers, Organic Herbs, Specialty Vegetables, Trees, Edible Flowers, Tropical Plants, Fruits, Native Plants and Hydroponic Tomatoes, and other vegetables all pesticide free. Discover how a Greenhouse Business can be a Fun, Easy, Money Saving, Hobby or Occupation. "Secrets to a Successful Greenhouse and Business"
A Complete Guide to Starting and Operating a High-Profit Business that Benefits the Environment. If you ever consider installing a greenhouse, or already have one, this book can help you turn your expenditure into a profitable venture. University of California - San Luis Obispo, Poly-Tech, says "If you operate a greenhouse for profit, you need this book." The Growing Edge Magazine says, "Excellent how-to-guide. A gold mine of information." 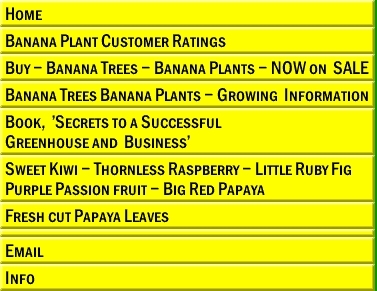 * Who to Sell to -- Nationwide Plant Buyers List. * Which Plants Sell Best, when and how to grow them. * Selling to the Largest National Chains and Local Markets. * Growing Herbs and Specialty Food Crops, Organic and Hydroponic. * Free Solar Greenhouse Plans in book with inflated double poly roof for up to 30'x 96' size. 2-- Specialized Projects with Excellent Profit Potential- This includes Annuals. Hydroponic Tomatoes, Lettuce, Cucumber and Peppers, Native Trees, Tropical Fruit, Bulbs, Cactus, Foliage plants, Ferns, and Flowers. Full of Tips, Ideas, and Resources. Generously illustrated and produced on recycled paper. Author available for questions at anytime, always free. Retail price for the 2010 edition is $39.95, get it here from the Publisher. 100% Money Back Full Refund at anytime, no time limit. We take most all credit cards. Our Standard checkout is a Secure Yahoo store. Greenearth Publishing Inc. doesn't sell, rent or reuse any info request or customer information. Orders are sent the next day by Priority Mail.